Gluttony is perhaps the most tolerated sin in American Christianity. I say this, not as someone who is immune from the attractions of the buffet line, but as someone who needs all the help he can get. And I think if we’re honest with ourselves, most — if not all — of us have a dysfunctional relationship with food. We love it, and we hate it. We often find ourselves careening between stuffed stomachs and crash diets. Or perhaps we’ve given up altogether, watching with resignation as our waistlines expand into the distant horizon. And then there’s that pesky issue of guilt. Restaurants use it like forbidden fruit to get us to save room for dessert. Fitness programs use it like a cat o’ nine tails to whip us into a lifestyle overhaul. Our own conscience, even, can rebuke us with how often we fall short of glorifying God with our stomachs. Guilt is powerful. Like the lawyers of Jesus’s day, it loads people with burdens hard to bear, and yet it will not lift a finger to help (Luke 11:46). So as we consider the issue of gluttony, my aim is not to shame you into injecting more kale chips and chia seeds into your diet. My aim, to use the language of Hebrews, is to strengthen your hearts with grace (Hebrews 13:9). Gluttony, after all, is food worship. It’s table idolatry. It’s more about the direction of our loves than it is about the contents of our cupboards. How, then, do we discipline our appetites? One answer — and the one I want to explore here — is to quite literally turn the tables on gluttony by coming to the Lord’s Table with fresh resolve and fresh hope. In other words, I want to encourage you to see the Lord’s Table, not simply as a weekly or monthly or quarterly ritual, but instead as a training ground for self-control. Gluttony is more about the direction of our loves than the contents of our cupboards. Here are eight ways the Lord’s Table helps us in the fight against gluttony. 1. The Lord’s Table reminds us that food is a created good. It is striking to me that the Lord has commanded the church to remember his death with a corporate meal rather than with fasting, as important as fasting is. When we talk about gluttony, if we’re not careful, we can speak in a way that suggests food is dirty. But Mark 7:19 tells us that in his ministry, Christ “declared all foods clean.” And so, when we eat the bread and drink the cup, we proclaim with Paul, “[E]verything created by God is good, and nothing is to be rejected if it is received with thanksgiving, for it is made holy by the word of God and prayer” (1 Timothy 4:4–5). 2. The Lord’s Supper reminds us that food is not an end in itself, but is meant to teach us of our soul’s need for Christ. Calvin wrote this in the Institutes about the Lord’s Supper: “Now Christ is the only food of our soul, and therefore our Heavenly Father invites us to Christ, that, refreshed by partaking of him, we may repeatedly gather strength until we shall have reached heavenly immortality” (4.17.1). What we experience in the Lord’s Supper should fan out into all the meals of the week, so that even when we eat Lucky Charms on Tuesday morning we are reminded of our soul’s need for Jesus. 3. The Lord’s Table reminds us that sin is serious. All sin, including gluttony. Because our eating and drinking together proclaims the Lord’s death, we remember that our self-indulgence is not something to take lightly. Christ was pierced for our transgressions. He was crushed for our iniquities (Isaiah 53:5). It was not just our pride and our anger and our greed that led Jesus to the cross. It was our gluttony as well. And so we should grieve for the times when we have worshiped and served the cafeteria rather than the Creator (Romans 1:25). 4. The bread and the cup remind us that Jesus has atoned for our gluttony. 5. Jesus is the Lord of the table, which means that the table is no longer our Lord. Not only has Christ cleansed us from the stain of gluttony, he has also freed us from its power. When Jesus died, we died with him and, as Paul writes in Galatians 5:24, “[T]hose who belong to Christ Jesus have crucified the flesh with its passions and desires.” I think that oftentimes we indulge our excessive cravings for food because we feel powerless to do anything else. But just as he did in the temple during his ministry, Jesus has overturned the idolatrous tables in our hearts, driving out with a whip all of our greedy cravings. We don’t have to serve our stomachs any longer, Christian. We’re free. 6. The Lord’s Supper provides us with an opportunity to affirm our love for our fellow believers. 7. The Lord’s Table reminds us of the beauty of self-control. If you’re like me, sometimes my hunger for lunch can make me antsy when sitting through a church service. On the Sundays when our church takes communion, it can sometimes feel like a cruel joke to taunt my stomach with a tiny piece of cracker. But in my saner moments I realize this forced moderation is a gift to me. And so I can eat and drink with joy because I know that a full stomach is not my greatest good. I’m reminded that self-control is a precious fruit that the Holy Spirit is intent on bringing forth in my life. 8. The Lord’s Table reminds us that the real feast is yet to come. Jesus said of the cup, “I tell you I will not drink again of this fruit of the vine until that day when I drink it new with you in my Father’s kingdom” (Matthew 26:29). Gluttony tempts us with thinking that this life is our only shot at eating high on the hog. But when we take the Lord’s Supper together, we look forward in anticipation to the great banquet that we will enjoy in the age to come when, according to Isaiah 25:6, “the Lord of hosts will make for all peoples a feast of rich food, a feast of well-aged wine, of rich food full of marrow, of aged wine well refined.” No steakhouse can match the bounty we will soon enjoy together. So we’re not missing out on anything when we rein in our stomach’s impulses. We’re just declining the appetizers so we can enjoy the main course. 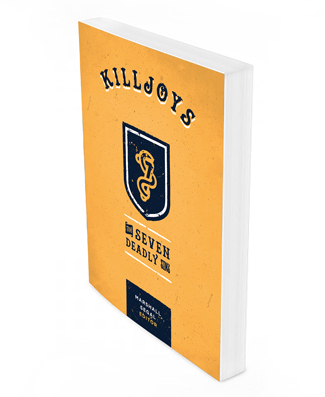 Johnathon Bowers contributed a chapter on gluttony to the new book from Desiring God, Killjoys: The Seven Deadly Sins. All electronic versions of the book are free of charge at desiringGod.org. Print copies are available through Amazon. Killjoys was written to lead you deeper in love with our God and further into war against your sin. Pride, envy, anger, sloth, greed, gluttony, and lust are woefully inadequate substitutes for the wonder, beauty, and affection of God. This short message was part of the 2015 Conference for Pastors, which includes several more messages — all free of charge.